PREP is for students in grades 1-8 that attend public school. PREP prepares children for Sacraments and fosters faith development for children and their families. Classes are held on Sunday mornings from 9:30-10:45. This year classes begin August 26th. Be sure to register early for class placement and so we may purchase textbooks and supplies needed for each student. Visit the St. Aloysius website, quick links, PREP and download the registration form, calendar, and handbook. If needed you may pick up a hard copy of the forms from the parish office. Now that Lent is over the ladies who met to discuss The Best Lent Ever series have decided they would like to continue to meet for faith sharing until school is out for the summer. Therefore, we will continue to meet on Thursday mornings April 12-May 24 from 10-11 in the Dickman Center. We will watch “Faith Clips” by Bishop Robert Barron. He answers 50 theological and spiritual frequently asked questions across diverse topics. All ladies are welcome to join us. No need to register or attend every week. Just come when you can. For further information contact Mary Hynes at the parish office. Holy Family Radio on WLCR AM 1040, Louisville’s only Catholic format radio station, will be hosting their Spring Radiothon, Thursday and Friday, April 12 and 13. Tune in to learn more about how you can help support Catholic Radio in the area! Consider making a pledge during Fr. Stoltz’s segment at 10am on April 12 and help St. Aloysius be the parish with the most pledges! Call 451-9527 or visit HolyFamilyRadio.org for more information. Listen online at WLCR.org. The annual Easter Egg Hunt, Presented by the Women’s Club and Knights of Columbus Saturday, will be held March 24th at 10:00am. Hunts to go off divided into age groups at approximately 11:00am. There even will be a visit from the Easter Bunny himself! Donations of candy are needed as well. Stuffed eggs or candy donations can be turned in to the Parish Office by Tuesday, March 13th please. We appreciate the help to make this event a success! How Would You Feel About Free Tuition?! 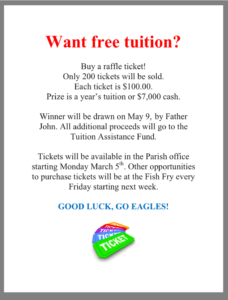 The parish is raffling off a year’s tuition for one student or $7,000 cash (winner’s choice). Tickets cost $100 each. For a full list of details see the flyer below! https://www.staloysiuspwv.org/wp-content/uploads/2016/08/header-logo-3-300x153.png 0 0 Mandy Kumler https://www.staloysiuspwv.org/wp-content/uploads/2016/08/header-logo-3-300x153.png Mandy Kumler2018-03-11 23:20:442018-04-03 12:17:49How Would You Feel About Free Tuition? !